On 25 April 2016, the first national top level domain, .nl, celebrated its 30th anniversary. On 25 April 1986, CWI took care of registering the NL top level domain in the framework of its international and national networking activities. On 25 April 2016, the first national top level domain, .nl, celebrated its 30th anniversary. On 25 April 1986, CWI took care of registering the NL top level domain in the framework of its international and national networking activities. This first country domain was registered by Piet Beertema (CWI), who played a central role within EUnet - predecessor of the open European Internet, together with Teus Hagen, Jaap Akkerhuis and others. The first domain Piet Beertema registered was cwi.nl. Beertema managed the .nl domain for ten years. Due to the explosive growth of the number of domains, the task became too hard for one person. In 1996, the Stichting Internet Domeinregistratie Nederland (SIDN) was founded, which took over Beertema's registration work in January 1997. After that, Beertema became a board member of SIDN. In 1999 he received a royal decoration for his pioneering work for the Internet in the Netherlands and Europe. 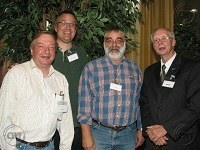 Picture above: Internet pioneers Jaap Akkerhuis, Daniel Karrenberg, Teus Hagen, and Piet Beertema (CWI) at Piet Beertema's farewell party at CWI on the occassion of his retirement on 16 September 2004. Source: CWI. 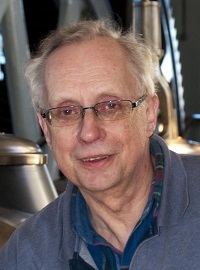 Piet Beertema in 2011. Foto: Aschwin Fokker.